Most of us can only dream of an office as cosy as home. Good news for hot deskers: your wish is granted, thanks to Asia’s first hospitality-inspired co-working space. The space boasts chic Mad Men-inspired interiors with its rich, tan colour palette, sumptuous leather sofas, sleek timbre desks and brass-finished shelves. You’ll be cared for in here: complimentary brekkies (with freshly brewed Papa Palheta coffee – available all week) and 10-minute massages are available on Mondays. And if you’re working late, a turndown cart makes its rounds to reward hard workers with warm cookies. Expect tons of office events like salon sessions over cocktails, masterclasses, wellness workshops and the likes. This homegrown venture prides itself in being more than your run-of-the-mill co-working space. Sure they have a few workspaces around town (the newest location in an Amoy Street shophouse is now open!) but it’s the innovation-centric ecosystem that makes them stand out. Apart from putting together a stellar office space in prime locations, it’s also a launchpad of sorts that really wants you to grow. Signing up with them gives you more than just a desk or unlimited coffee. You get access to a network of potential clients, mentors and collaborators. You can make connections with strategic advisors, coaches and they even introduce you to a pool of investors and partners <insert oohs and aaaahs>. Not content with being just a gorgeous co-working space, Just Co takes the competition up a notch with its entertainment factor. Meeting rooms and a well-stocked pantry aside, the breezy space is also home to a ping pong table and an arcade room for you to blow off steam after a long day of work. Also, bonus points for its central location amongst bars, gyms, fab restos and MRT stations. Just Co, various locations including Marina Square, Raffles Quay, Robinson Road, MacDonald House and more. Leave it to the National Design Centre to house a fabulous and collaborative space for design-preneurs. Being a young designer with an eponymous label or a start-up is hard work, but Paperwork tries to make things better with a space that’s high on design and co-creation. We reckon it’s the perfect environment to cook up your next collaborative adventure! “No fuss, no frills, cheap beer, good music and great people” sounds like our kinda vibe. 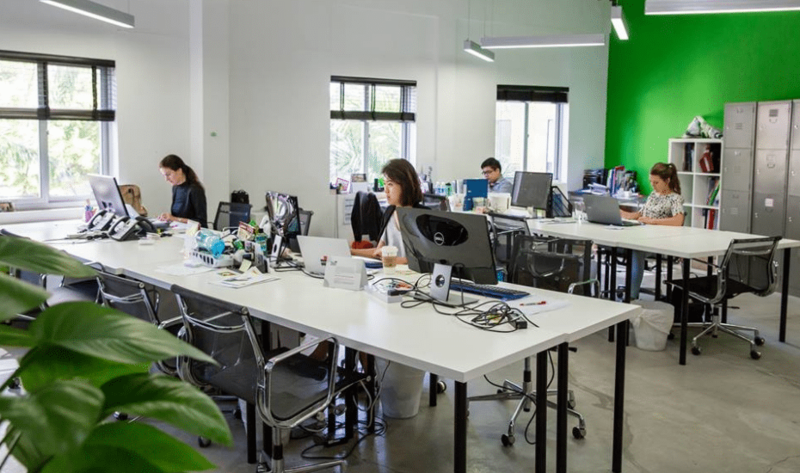 With The Sam Willows’ Narelle Kheng as one of the founders, this co-working space morphs into a chilled out hang every Friday and Saturday. Designed to be cosy and young, Moonstone is a workspace for the creative lot. Artists, illustrators, photographers and writers, this is your second home filled with good vibes, arcade games and old-school snacks. Right in the heart of the CBD on Cecil Street is this refreshing and light-filled co-working space. Ideal for no-fuss kinda people who need a clean, white and bright space with a sprinkling of potted plants and an MRT you can stroll to. Wotso also has a lovely sky terrace if you need a change of scene or an informal meeting place. Got a dog? You can even bring your little fur-baby over to the office, it’s all cool! Imagine an office with cubicles, tight spaces and everyone at their individual desks. Now throw away that image and check out the co-working spaces of WeWork. The international company opened their 200th location at Beach Centre and such a visual treat it is. 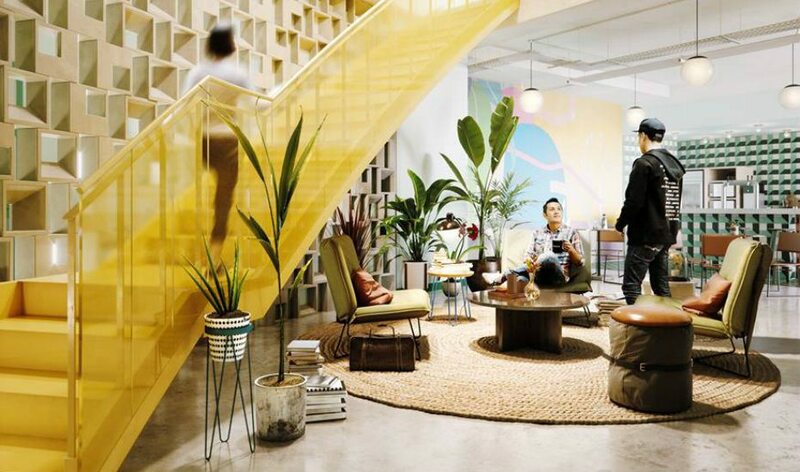 Littered with plants all around, cushy leather sofas, lots of natural light and pastel colours, WeWork Beach Centre looks more like your dream house rather than a stuffy office space. And don’t get us started on the beautiful Robinson Road branch. All that gorgeous midcentury modern furniture makes the interior addict is us ultra happy. And those patterned, happy-hued carpets, curvy staircase, contemporary artworks and the much-appreciated phone booths add to the appeal. Get a load of this 10,000 sq ft minimalist space located at Odeon Towers in City Hall. The Company has everything you need if you’re working in a team: private studios for two to four people, a big boardroom, small meeting rooms, and offices which can accommodate up to 20. Got a major event in the works? Its event space can hold up to 100 people and includes an eight-metre high ceiling with a projectable wall. If you’re into speciality Japanese coffee, the in-house cafe Kurasu has you covered. Fancy working in a three-storey heritage building that’s oh-so Pinterest-y? Camelia & Co is spread across three sections – The Daily Sphere for hot desking, The Daily Grind for semi-private office space and The Luxurious Hideout for a private, cosy workplace for eight, complete with a meeting room and storage space. Plus, there’s a rotating roster of events to keep you on top of your networking game. A central location, all stone and clay, minimal furnishing that’s handpicked themselves to lend that personal touch to the space and lots of room. With over three shophouses of generously sized offices and discreet nooks for small meetings, conversations and contemplation, Silo dubs itself as an “office by introverts, for introverts. Writers take note, this sounds a lot like what we’d love. Creatives assemble here, at this new hotspot in the East. 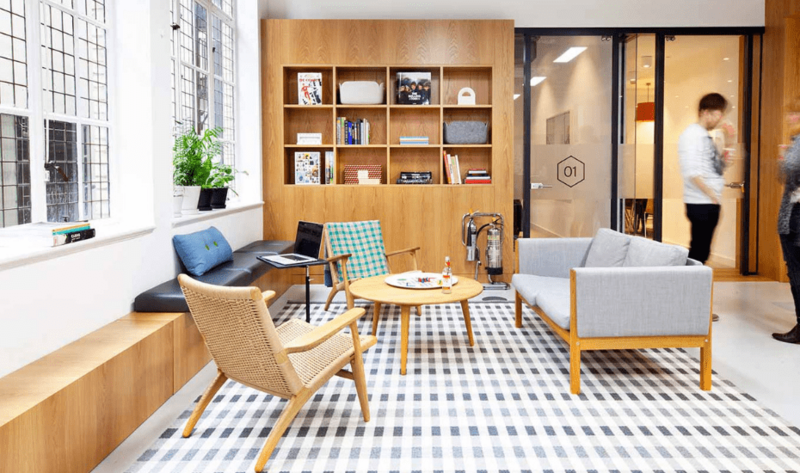 Mox, from the word moxie – and is the only working space in the list to have facilities such like 3D printers, laser cutters and specialised working stations equipped with design software, and more for creatives and makers. 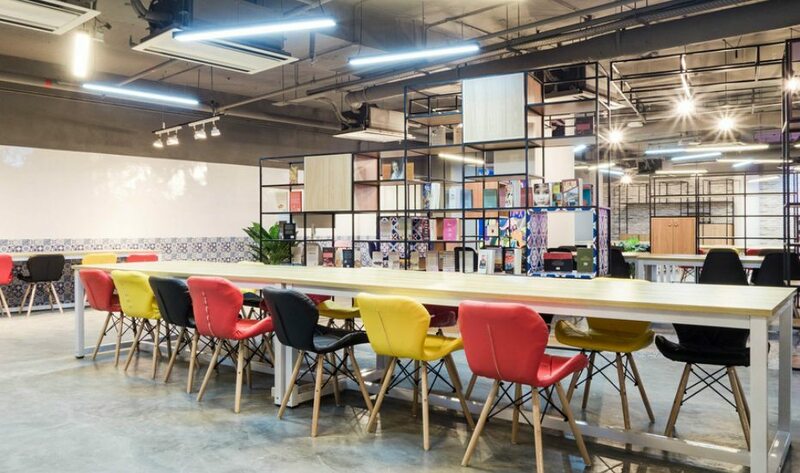 Located in Katong Point, the three-storey facility has a retail space, workshop rooms and a co-working space that can accommodate up to 200 people. We’ve got smart homes and you know we were psyched to hear about Distrii’s smart office. 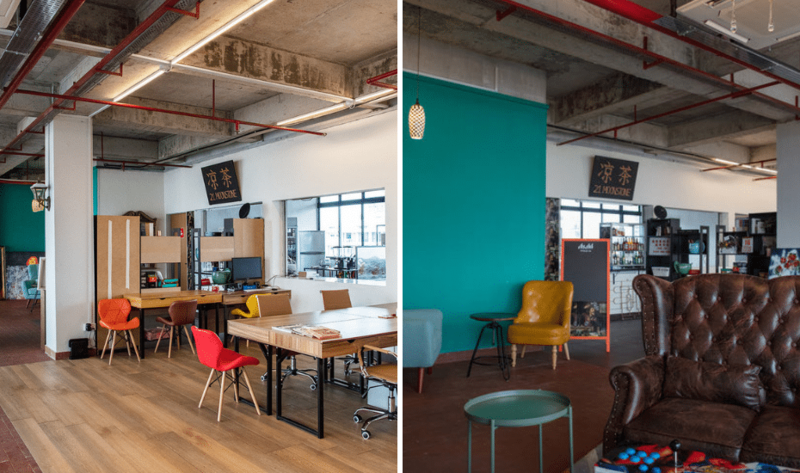 Roomy desks (900 workstations), food (at Hans im Gluck) and competitive prices aside, the seven-storey Distrii takes things to a whole new level by introducing a handsome helping of technology to co-working spaces. At the heart of it is the inhouse Distrii mobile app – a cloud-based system for integrated business solutions. Yup, that single app is the key to the office, your locker, a video conference and meeting room booking tool, task and internal admin manager all rolled into one. Plus, you can also make use of a special member-only platform with over 15k people built to make meaningful connections, encourage collaboration and share resources. Housed in a historic Art Deco-style building along Keong Saik Road, The Working Capitol is a beautifully appointed space – complete with calming, minimalist decor and oodles of natural light. The amenities are nothing short of stellar, with an in-house café, screening rooms, private phone booths, and even a beer garden for after-hours fun. Depending on your working needs, rates start from $150 for a Workspot. Also, great news for fans of the space: it’s just opened a brand new location in the heart of the CBD. The Robinson Road outlet is spread across eleven floors and looks set to be as conducive a space as its original location. Its custom-designed areas fit all sorts of working needs, including quiet focus, recharging and collaboration. It’s also made to feel like a home away from home, with showers, a 20-metre lap pool, a gym as well as a cafe, restaurant and bar. The Working Capitol, Two locations in Keong Saik Road and Robinson Road. Working parents, say aye! 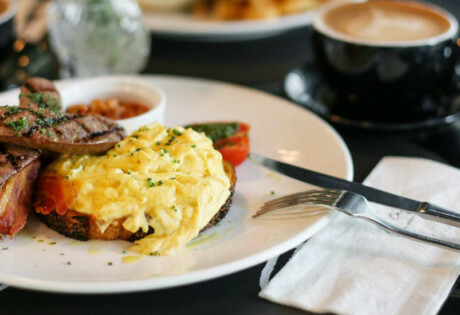 This multi-purpose space located inside Tanglin Mall might just be the place where you can get down to business…literally! Working mums and dads can bring their kids down to Club Coco Nut and enrol them in edutainment classes. Think art exploration, sensory workshops, multi-sports, karate, yoga, Mandarin and more. While your tots are busy playing x learning, get work done at the co-working space in the vicinity. Its charged by the hour for a kid-free zone where you can be your most productive self and even meet/collab with like-minded parents. ClubCo truly is a hidden gem just waiting to be discovered. Tucked away cosily on Cross Street, it ticks all the boxes: the modern concept space kitted out with contemporary furniture by BW and even better: it’s open to anyone. Not only does ClubCo offer a free seven-day trial, but it also has an enticing deal for anyone signing up: Pay $400 for the first three months, and you get to work anywhere in the Collab Zone while enjoying one-hour free Meeting Pod Usage monthly. But what really cinched the deal for us is its handy location: just a stone’s throw away from Club Meatballs! It’s easy to see why The Co is so popular – its two locations boast major swank factor. Over at its High Street location, there are eight levels (!) of space, which means ample room for all workspaces – ranging from pods to breakout spaces, meeting rooms, and even private offices for larger enterprises – and three event venues for networking opps. Its Duxton location is no less of a winning workspace, with its greenery, abundance of natural light and chic interiors. The Co, Locations at 75 High Street and 99 Duxton. Vibrant spaces, prime locations and an engaged community, Spaces has it all. So what sets them apart from the rest of the lot? Spaces is rather flexible with their plans, so you can tailor make contracts to suit your need. And what if inspo hits you at odd hours? You can head to your desk at Spaces any time of the day, it’s open 24 x 7. Perfect for people who work remotely with businesses on the other side of the globe. Take that time difference! Hands up if you’re a working parent struggling to get the job done. 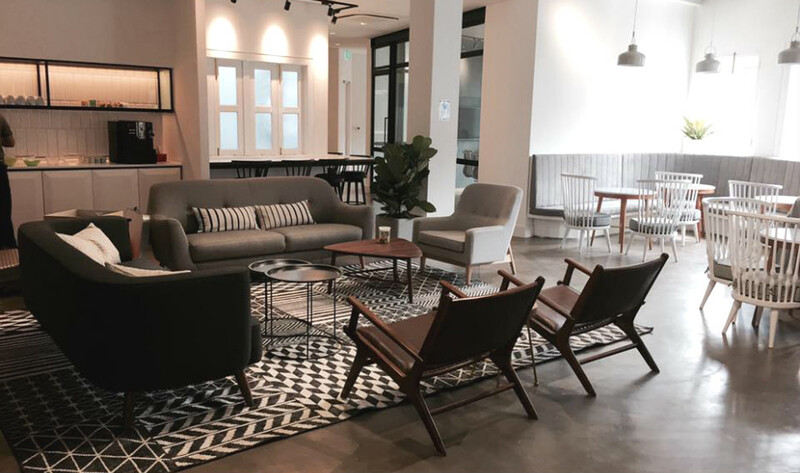 Singapore’s first family-friendly co-working space is a godsend for harried mums and dads. The swish set-up includes child-minding and learning facilities alongside varied work areas for different levels of privacy. Everything you need is here for a fruitful day of work: private offices here for meetings and client calls, a sunny deck for socialising with like-minded parents, and a kitchenette with drinks and snacks. As for the little ones, there’s plenty to do, with painting and sensory play amongst the many activities provided. Trehaus, #03-01 Claymore Connect, 442 Orchard Road, Singapore 238879. With two studios under its wing, Smart Space is no minor player amongst co-working spaces here. 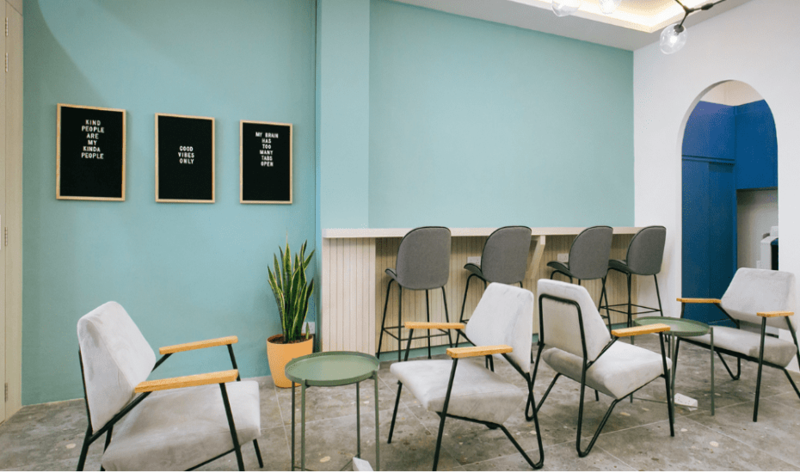 Its Clementi location at Enclave Hostel is geared towards entrepreneurial students and young start-ups (yup, you can even slog overnight here). But it’s its sprawling 8000-square feet Bras Basah locale that’s best suited for the CBD bees, with meeting rooms, showers, kitchens and even a table tennis area. Rates are reasonable, at $30 a day and up to $600 a month. Smart Space,#03-32/36, 261 Waterloo Street, Singapore 180261. A prestigious location in the heart of the CBD? Check. Premium interiors? Check – solid oak, leather and a linen interior game. But what truly separates Collective Works from the rest of its pack is its thoughtful environment. All of its seating is certified ergonomic, desk heights are adjustable, overhead lighting is carefully adjusted to minimise glare and low VOC (low-level toxic emissions) paints are used for its walls. Plus, you also get access to their exclusive members events that encourage networking and collaborations. Collective Works, locations in Capitol Tower and Cecil Street. Specially catered to innovators, Collision 8’s space regularly hosts an interesting mix of entrepreneurs. With its sleek interiors, this place creates an inspiring environment for members to experiment and create as they wish. 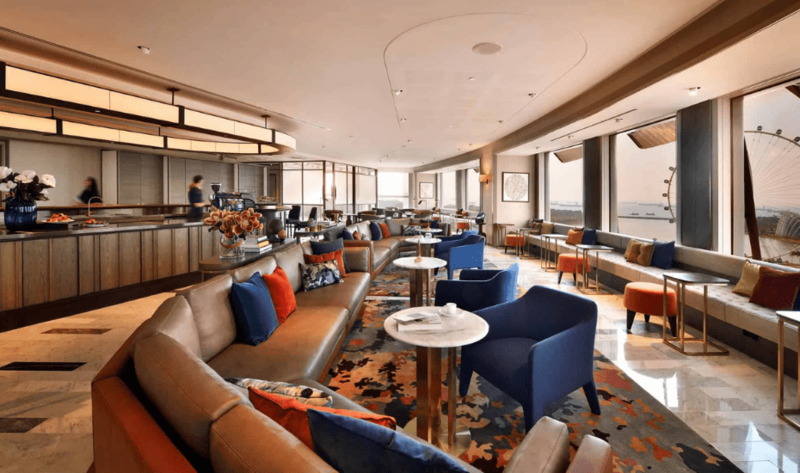 Panoramic views of the Marina Bay skyline greet visitors in its workshop space, while common spaces like its library and lounge are nothing short of decadent. The Hive Singapore is the latest addition to its lineup of Asia locales (which includes Bangkok and Hong Kong) with more in the works. This spells good news for frequent jetsetters; members are entitled to Hive Passports, which allows you access to all of its other locations. Bonus if you’re a budding entrepreneur: the space regularly hosts networking events, ranging from informal drinks to specialised meet-ups. There’s also a new MakerHive for the creative lot that combines workshops with special equipments and workspaces in a sprawling 7000sq ft space housed within the Hive Lander.